Alongside the new Surface Laptop announced today in NYC, Microsoft also unveiled their next play with Windows 10. 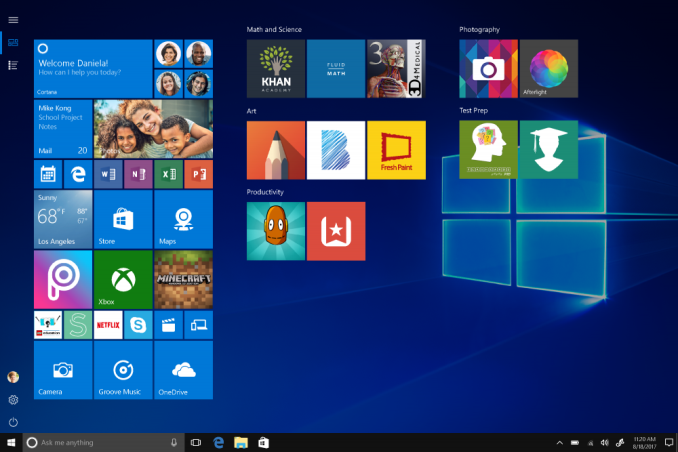 Windows 10 S launches as a fresh take on an old idea. The old idea was “What happens when you lock Windows to only using Store bought apps, like iOS” and Microsoft has obviously given this one try already with Windows RT. Based on Windows 8, but only available on ARM based PCs, and only able to run Windows Store apps, Windows RT was a complete disaster, and it was abandoned by the Redmond company shortly after it was released. Windows RT never even got the Windows 8.1 update. It’s difficult to argue with the idea though. Windows has a fairly amazing support for legacy hardware and applications, but that same legacy opens it up to security vulnerabilities, and even applications which can wreak havoc on the system with excessive permissions, and unpatched issues. Anyone who chooses a Google Chromebook over a Windows PC does so, at least partially, to avoid these issues, and to enjoy the speed and reliability that comes with a locked down operating system. Windows 10 S is Windows 10 inspired by students and teachers, and by inspired by, Microsoft means the know that they are losing the education market to Chromebooks in a big way. Chromebooks are cheaper, more reliable, easier to setup and configure, and quicker to get using in class. No teacher wants to deal with a 15 minute login process as all the students try to get logged in the first time on a slow laptop, and for these reasons, Chromebooks have really gained a foothold in the education market more than anywhere else. 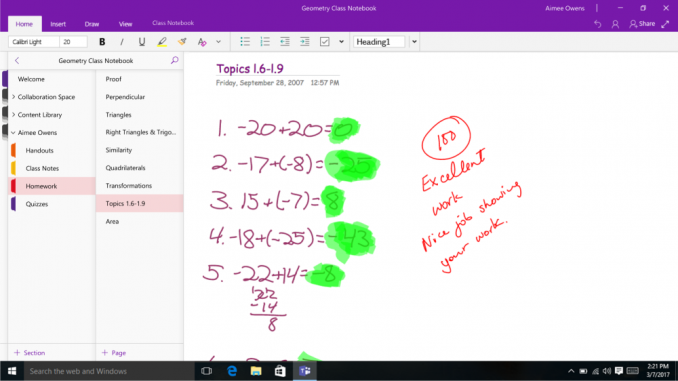 Windows 10 S is Microsoft’s answer to that issue, but they are hoping for a broader adoption than just education. Honestly, it feels like the direction they want to go for Windows and although there are always going to be people who need access to apps outside of the store, we are certainly at a point where this makes more sense than it did when Windows RT launched. There are some major differences with Windows RT though. First, Windows 10 S is not restricted to ARM laptops. For that matter, it’s also not restricted to x86 laptops, and it would make sense to see Windows 10 S available on ARM based PCs coming later this year. 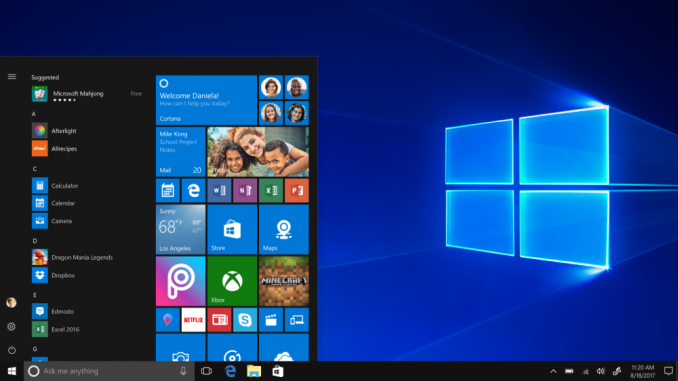 Second, Windows 10 S can be unlocked to Windows 10 Pro. So if you do need to use apps outside of the store, you can pay to have the system unlocked. Finally, the Store has changed as well, meaning this is not quite as restrictive as it once was. The major change with the Windows Store since the days of Windows RT came with the Windows Desktop Bridge, code named Centennial, which actually came with the Windows 10 Anniversary Edition. This one bridge allows developers of traditional Win32 apps to easily package their apps for distribution in the Store. They are not UWP apps at this point, but they are packaged apps, much like you would see on a Virtual App, and the Store can be used to update these apps in the future, rather than having to force the end-user to either manually update, or live with yet another update service running on their PC. Although we’ve not seen the UWP framework, or even the Desktop Bridge, have strong support yet, this is yet another carrot to entice developers to push their applications to the store. There are strong benefits for users, since apps are always up to date, and the installation process is simple, and uninstall is also simple. Apps can’t leave leftover registry keys or files, and it is a much better process than the traditional install methods. Here’s a great example of how the Desktop Bridge helps the user experience. Adobe Photoshop Elements 15 is available in the Windows Store. Not only does this give you the install for up to ten devices, rather than one, the install is as simple as clicking Install in the Store, and waiting. We’ve all done this on iOS and Android, and once the app is downloaded, it runs. I use this program from the Store on a couple of my PCs, and it works great. But a friend called and was trying to install Adobe Photoshop Elements 15 on their Windows 7 laptop, and every time they tried to run it, it would give an error and quit. I remotely connected to the laptop, and it took about an hour to figure out it was their backup software preventing the application from installing. That software had to be disabled, the computer restarted, and then Photoshop Elements installed, and then the backup software enabled again. With Store apps, these kinds of issues don’t happen because each store app is sandboxed. Windows 10 S is definitely Windows RT v2, but without being quite as restrictive. There is an option to unlock full Windows as well, which is something that was never available on RT. It should be more secure, and Microsoft showed off how much quicker it is to do tasks like deploying applications and logging in for the first time. 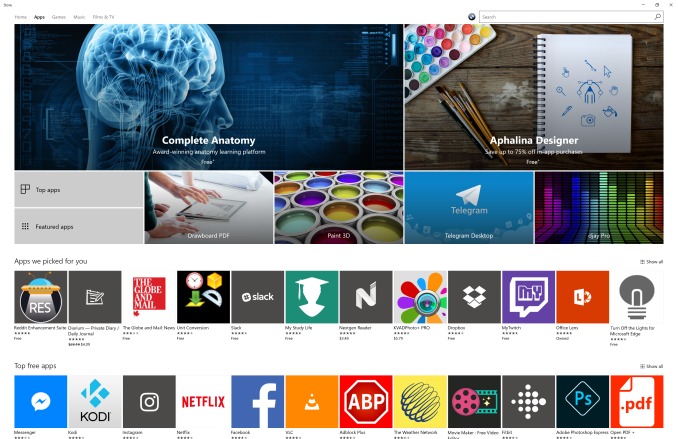 We’ll have to wait and see how much traction they have in Education with this though, and the Windows Store, while vastly improved over what was available when Windows RT launched, still doesn’t offer the wide variety of applications like you would get in iOS. Unless Microsoft can get devs to embrace UWP or even the Desktop Bridge, it may be difficult to see this having much support. The strength of Windows has always been its downfall, and that strength is the vast amount of legacy application support. Microsoft has tried before to wean people off of this legacy before, and they were not successful. Luckily, Microsoft is having their annual developer event in about a week, so we should learn more then in regards to their strategy to bring more apps to the Store.